With a long running manga behind it and Production I.G taking control it was hard not to be a little excited for Blue Spring Ride when the series started airing last season. So, did our anticipated Shojo series live up to the hype and my high hopes? 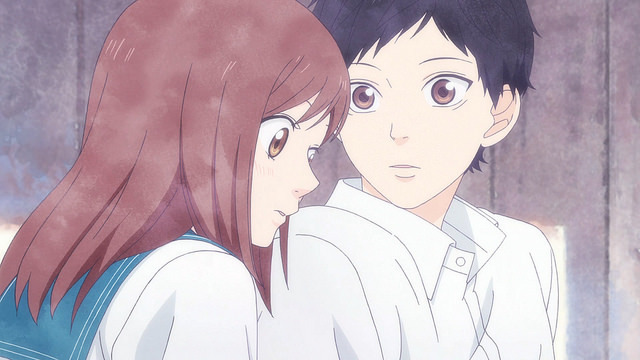 Blue Spring Ride follows the story of childhood friends Futaba Yoshioka and Ko Mabuchi. Ko and Futaba were close during their middle school years before Ko transferred away due to family reasons, now the two have been brought back together for their high school years but Ko has changed a lot in their time apart. The series is trying to tell two stories here. On one hand it’s trying to explore a theme of friendship and the fact Futaba feels like she has to change who she is in order to change, something that quickly changes upon her reuniting with Ko and making some new friends. Ko is also largely on his own and thus the series brings together a group of friends and we see them overcome many challenges together. 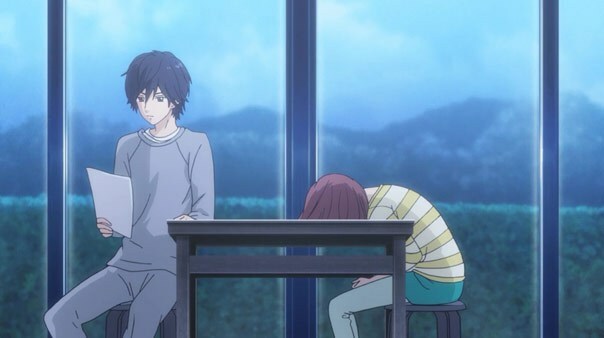 On the other hand Blue Spring Ride is a Shojo and trying to bring together Futaba and Ko who evidently have feelings for one another and have done for quite some time. This is where a small amount of problems begin. 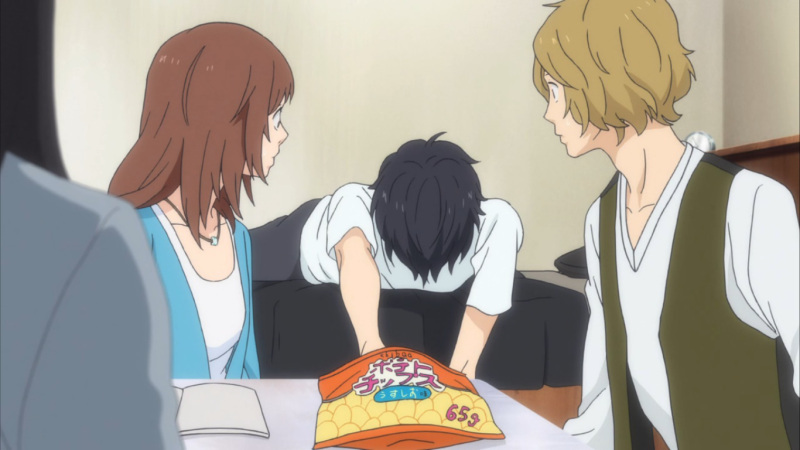 Blue Spring Ride succeeds in the theme of friendship. It also succeeds in exploring why Ko has become the way he is now and overall once we learn more about his character the answers feel really satisfying to the viewer. Sure, for the earlier episodes you really won’t like Ko as he is now, but as the story unfolds and we learn more you’ll begin to understand and care for his character a lot more than you will to start with. It’s also very pleasing to watch Ko interacting with this new group of friends and be pulled along by Futaba. Futaba herself is an interesting character and although we never really learn much about her, she too feels like a character you can relate to and who you can cheer for throughout the show. 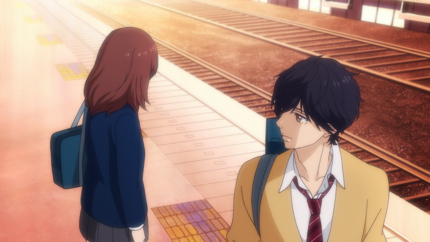 On the flip of the coin however Blue Spring Ride struggles with the romantic aspects. It’s true that nothing can truly develop between Futaba and Ko until his past is explained and dealt with, but at the same time this isn’t done until the end of the series leaving any romantic loose ends firmly untied. The problem is Blue Spring Ride wanted to do both, even bringing in a rival for Ko’s affections which again goes nowhere. It’s more a problem with the adaptation itself then the original source as I’m sure the manga has dealt with it better than a 12 episode anime has, but at the same time it won’t make for the best viewing if you’ve gone in hoping for a strong love story. With all that said Blue Spring Ride does come to a close in a fairly satisfying manner overall and as long as you can look past the romantic side of things being a bit overlooked then you’ll be quite happy. After completing the show I’ve become quite eager to read the manga, which can only be a good sign. Overall Production I.G have worked hard on the series in terms of animation. It can feel very generic in places but at the same time the studio have given it an interesting twist in that whenever we’re seeing scenes to do with Futaba and Ko’s past or memories the animation takes a watercolour approach, like which you can see in the screenshot above. It definitely looks great in action and isn’t overused. The most we see of it is during the first half of episode 11 as we finally learn more of Ko’s past. Apart from that we only see this animation approach a little during the opening and then perhaps once per episode, but definitely never often enough to get sick of it. Character designs are simple but Futaba and Ko do stand apart from generic Shojo characters. Ko is quite sharp in his design but it matches his attitude and works well when you get used to it. The soundtrack for Blue Spring Ride is being split over two discs and as you’d assume from that alone the series shows off a heck of a lot of music over the course of its run. Some of it is very simple pieces that just lightly play in the background to go along with the show while others really build up the feelings for some of the biggest moments in the series. It’s undoubtedly one of the better soundtracks of the year, especially among shojo anime, and one I won’t forget in a hurry so well worth keeping an ear out for. Overall Blue Spring Ride isn’t the best shojo I’ve ever watched and perhaps I won’t be remembering it for too long, but overall it manages a satisfying ending for a show with the source still on-going. If you don’t care too much for romance it’s well worth giving it a shot but otherwise give the manga a go. Fans of the manga will likely get a lot more out of the series then I did. For those of you in the US Blue Spring Ride can be found on Crunchyroll. 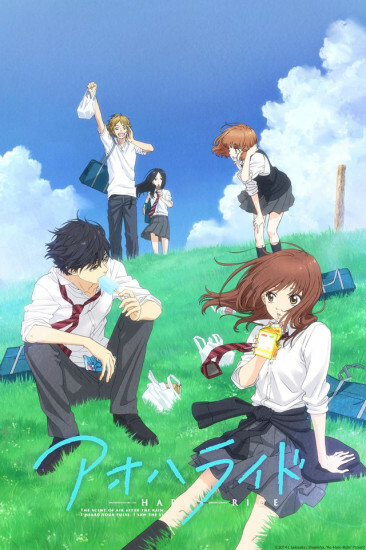 This entry was posted in Anime, Anime Reviews, Reviews and tagged Anime, Ao Haru Ride, Blue Spring Ride, Crunchyroll, Review on 11th October 2014 by Demelza Ward.